Introducing the 20' wide Skyline model, the Bridgepointe, to our display center! This beautiful home showcases a modern contemporary color scheme, laminate floors, plush carpet, recessed lighting, and 9' flat ceilings throughout! 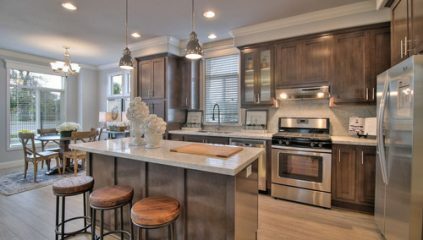 The signature granite island kitchen features stainless steel appliances, ample counter and cabinet space, as well as full height backsplash! The windows in the living room and dining room give the home the bright and cheery feel! The bedrooms are a comfortable size and have nice closet space! The built-in bookshelf in the hallway adds to the appeal! The master bath has granite counter tops and a tile shower! Tour the design center to browse our wide selection floor plans, countertops, paint samples, and finishes. For more information, please contact us at (866) 494-8993. 2017 Skyline Serial #: 2G998958F/AB HCD #: DL1164796 *This is a model home located at our display center. Current price based on this exact model placed in mobile home community. Price subject to change based on final placement of home. *List price excludes closing costs & escrow fees. *Information deemed reliable, but not guaranteed.